[EAN: 9787800476884], Neubuch, Ship out in 2 business day, And Fast shipping, Free Tracking number will be provided after the shipment.HardCover. Number of Pages: 229 Pages. Language: English. The Forbidden City (Zijincheng) stands proud to welcome the morning sun and The Hall of Supreme Harmony (Taihedian) bathes in the light of dawn. The Imperial Palace in The Forbidden City in Beijing is well preserved. It is the largest architectural complex of imperial palaces. not only in China. but in the world.It is situated in the middle of the 7.8-kilometer axis passing through Beijing. a world famous old capital. renowned for its revered status in history. art and science. Hence. it has long been listed in the first group of State Cultural Relics Preservation Units and the List of the First Group of World Cultural Heritage of China.Numerous books and articles with different viewpoints have been written about The Imperial Palace. However. The Grand Forbidden City - The Imperial Axis is the only book written with a focus on history. culture and architecture. and in a language complemented by architectural diagrams. A piece of research that reads well and makes use of diagrams and pictures to portray the history. culture and architectural art of The Imperial Palace in The Forbidden City is a rare find and this book is a delightful creation. Using exciting illustrations and clear language to depict a study of architecture is a very important technique in presentation. Mr. Chiu Kwong Chiu has excelled himself once again producing The Grand Forbidden City - The Imperial Axis after publishing his other works. Beyond Chinese Wooden Architecture and Running Notes on Qingming Shanghe Tu. both demonstrate the unique writing style of Mr. Chiu. His tremendous contribution to the research and promotion of The Imperial Palace of The Forbidden City is undeniable. Also. his insight into the topic has acted as a catalyst in discussions and promotions regarding other historic building relics.Four Satisfaction guaranteed,or money back. [EAN: 9787800476884], Neubuch, Ship out in 2 business day, And Fast shipping, Free Tracking number will be provided after the shipment.HardCover. Number of Pages: 229 Pages. Language: English. The Forbidden City (Zijincheng) stands proud to welcome the morning sun and The Hall of Supreme Harmony (Taihedian) bathes in the light of dawn. The Imperial Palace in The Forbidden City in Beijing is well preserved. It is the largest architectural complex of imperial palaces, not only in China, but in the world.It is situated in the middle of the 7.8-kilometer axis passing through Beijing, a world famous old capital, renowned for its revered status in history, art and science. Hence, it has long been listed in the first group of State Cultural Relics Preservation Units and the List of the First Group of World Cultural Heritage of China.Numerous books and articles with different viewpoints have been written about The Imperial Palace. 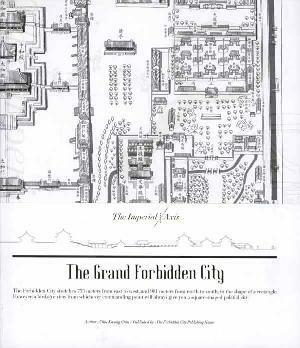 However, The Grand Forbidden City - The Imperial Axis is the only book written with a focus on history, culture and architecture, and in a language complemented by architectural diagrams. A piece of research that reads well and makes use of diagrams and pictures to portray the history, culture and architectural art of The Imperial Palace in The Forbidden City is a rare find and this book is a delightful creation. Using exciting illustrations and clear language to depict a study of architecture is a very important technique in presentation. Mr. Chiu Kwong Chiu has excelled himself once again producing The Grand Forbidden City - The Imperial Axis after publishing his other works. Beyond Chinese Wooden Architecture and Running Notes on Qingming Shanghe Tu, both demonstrate the unique writing style of Mr. Chiu. His tremendous contribution to the research and promotion of The Imperial Palace of The Forbidden City is undeniable. Also, his insight into the topic has acted as a catalyst in discussions and promotions regarding other historic building relics.Satisfaction guaranteed,or money back.